CodeMix – Better with You! Director of Customer Engagement - Loves technology and almost everything related to computing. 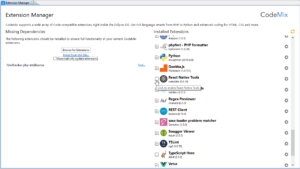 Wants to help you write better software. Follow at @brianfernandes. Thanks to detailed feedback from our awesome users, our team has been hard at work adding stability, reliability and performance fixes, and enhancements, to CodeMix. 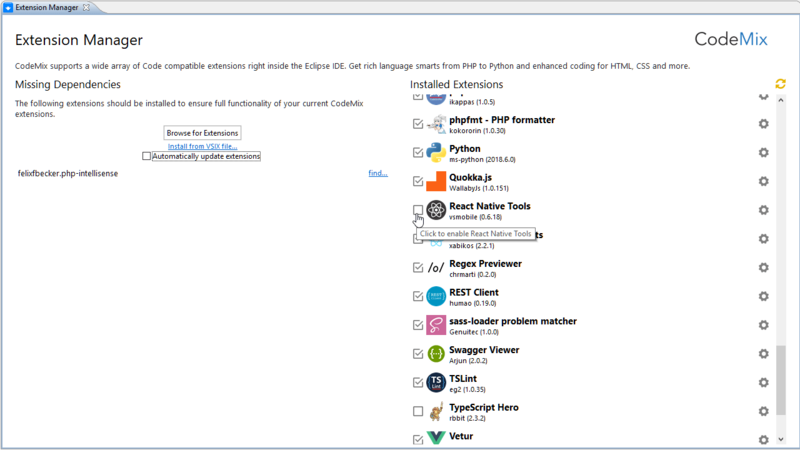 Read on for the deets on what’s new in CodeMix over the last month. When editing TypeScript files, error markers were sometimes not cleared when the error was fixed – markers now disappear when they should. CodeMining annotations were not relayed to the editor in all cases, resulting in unreliable annotations – this has been fixed. When formatting a file, the cursor could very frustratingly jump to the beginning of the file. The cursor now stays put. Because it’s always important to know exactly where you are, line and column numbers are now shown in the status bar for all CodeMix editors. The Ctrl + Shift + T key-binding will only be redirected to the symbol palette if you are using a CodeMix editor. In other cases, like when editing Java files, it will continue to open the familiar Open Type dialog. Syntax highlighting would not work for external files (those not in your workspace), when opened in CodeMix editors. They’re now more colorful. If you haven’t tried LivePreview for Java EE yet, now’s a great time – changes you make in the CodeMix HTML editor are relayed to the browser as you type, you don’t need to save the file or refresh the page. We no longer share extensions with VS Code – Code OSS extensions now live at ~/.codemix/extensions. Changes you make to extensions in VS Code will not affect extensions installed in CodeMix, and vice versa. In addition, you can now prevent CodeMix extensions from updating automatically by unchecking the, Automatically update extensions, checkbox in the Extension Manager. Finally, many users weren’t aware that extensions could easily be disabled from the manager, without having to uninstall them. Checkboxes next to the extensions hopefully make this obvious going forward. 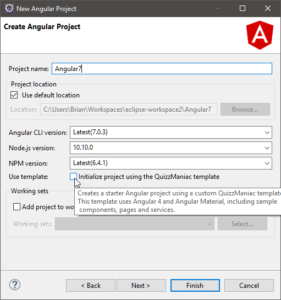 Angular 7 projects can now be created and served without issue, and several issues in the angular-ide module were fixed, resulting in better synchronization between the IDE, and your running Angular application. 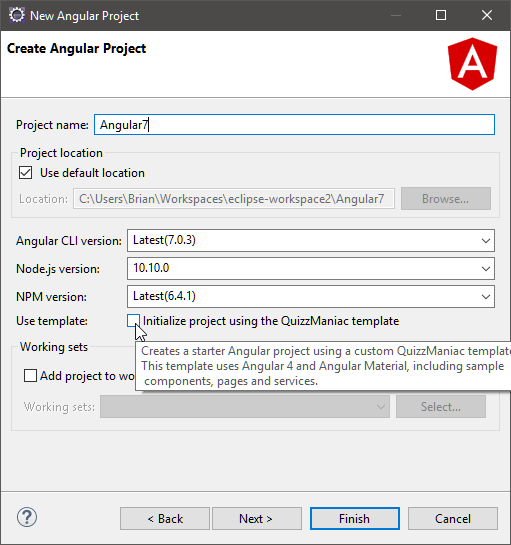 If you missed our handy starter project, QuizzManiac, it’s back, and you can use it as a template when creating new Angular projects. Also back are the Run / Debug As menus which make it easy to just serve your project, or initiate a debugging session. Antivirus software would affect both the speed and reliability at which the CodeMix engine could be installed, as well as updated. Similar issues would affect Terminal+ as well, leaving it defunct after A/V interference. While we’re continuing to make improvements in this area, the fixes already in the product make it far more robust, even with your favorite Antivirus actively monitoring. Several issues in Terminal+ around the ability to install (if required), and use the right shell have been fixed, this has resulted in an improved experience across the product, as several actions will ultimately execute in Terminal+. Oh, and if you’re bored with your currently executing program, Ctrl + C will now terminate it, as it should. Besides these key fixes, there are dozens of additional bugs that have been squashed across the product. Do keep your feedback and reports coming, we’re always listening.